ADA +4 Station Oahu Series | ADA Restroom Trailer | Portable Restroom Trailers, LLC. ADA Restroom Trailer + 4 Station | Oahu Series - Private Suites features 4 standard unisex suites, and 1 ADA unisex suite, each with a separate entrance. The standard suites include a pedal flush toilet, corner sink, and shatterproof mirror. The ADA-compliant unisex suite includes 1 wheelchair-accessible sink, shatterproof mirror, ADA Toilet, and grab rails.This suite also allows for a full 360 turning radius for wheelchairs and additional assistance grab rails, important details that your guests will be sure to notice! All suites include designer vinyl flooring and exterior lighting for safe entry/exit at any time during the day or night. 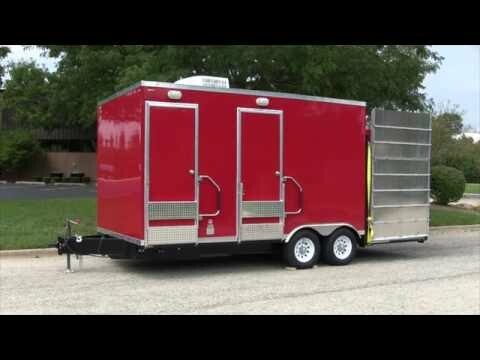 This ADA Restroom Trailer also features a lift system for the entire trailer to lower to the ground with the push of a button, and a fold up ramp for ADA access. Includes LED lighting, Smarter Restroom App, hot water hand wash, and upgraded foot pedal blocks to prevent pedal breakage.